Okay you guys, I'm trying once again to build up some hype for an upcoming film and this time - hopefully! - it will not be a cinematic disaster of the crispani degree. This one is called Schlop's Labyrinth and it comes recommended from none other than Neil Gaiman, so there. Well if you are too scared to see Schlop's Labyrinth, then maybe you will also be too scared to see one of the directors upcoming projects - a more realistic remake of The Witches! Remember that one witch that was trapped in the painting? I always thought that the reason Schlop stopped bathing was because he read the Witches. Posted: Fri Jan 05, 2007 1:35 pm Post subject: Scary! My snources are informing me that Lee might be heading out to the theater to see Schlop's Labyrinth! Be sure to post here what you thought Lee. Sorry, I didnt end up seeing Schlops Labyrinth. Instead I saw Casino Royale again. It was and still is a damn good movie. 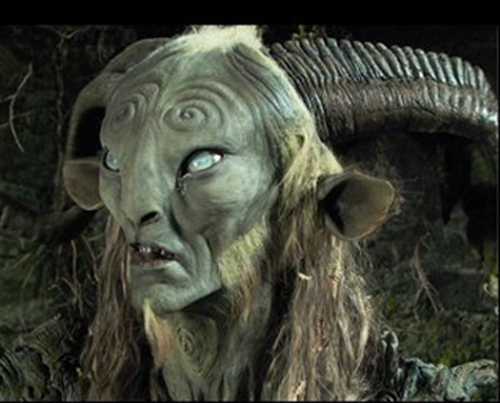 I saw Schlop's Labyrinth last night. Schlop asks that his name no longer be associated with such a scary movie. I sincerely hope that none of you bears EVER see this film. It was so terrifying and traumatic and upsetting and gory and WAAAAAAAAAAAAHHH. I don't think I've ever closed my eyes through more of a movie in a long time. Wahh.... so creepy. So scary. Waaaaaaahhh. I had to hug Schlop, Goober, Nibs, AND Sneeches all at once to recover. Also... it had really annoying sound effects. They way overdid everything. The moths were always whizzing around and when the Faun would eat there would be all these smacking and chewing noises... ew.... and then there was so much rustling and crunching. It was very distracting. Overall, 0 paws for a terrifying movie!! Posted: Tue Feb 20, 2007 11:08 am Post subject: Oh no! Not another scary movie! At least this time I didn't recommend it - like with Cache... I guess Nibs' cowardly premonitions were right. Maybe next you should see a happy movie. Are you giving it 0 paws because of the moths? Yeah, it's funny Snuffs, I remember thinking during the movie "I haven't been scared to my very core like this since Cache...."
I CANNOT believe ANYONE would take a child to that movie. The level of gore and blood and terrible terrible things that happen (Mother dying, blood pouring out of the mother) are just the beginning. The creature with eyes for hands is seriously like one of the scariest things I've ever seen, including all Resident Evil and Silent Hill sessions. That's funny that Shnoodles originally compared it to the crispani.... hoo hoo hoo. Did you hear that the guy who directed Schlop's Labyrinth is going to direct the Hobbit movies? Does this mean they will be really scary? I hope that there aren't any moths for Lee's sake! I have no idea how I missed this post. But wow, good reporting. I just stumbled upon this fact this weekend and FREAKED OUT. He is going to make the Hobbit movies FREAKY!!! WAAAAAHHHH!!!!! Posted: Mon Apr 28, 2008 3:07 pm Post subject: Oh dear god!! !